Enjoy at home or use disposable cups to eat on the way to school. Place oatmeal, salt, sweetener, and water in a microwaveable container. Cook on high for 3 minutes. Stir and allow to cool for 30 seconds. Place spoonful of oatmeal in a cup, parfait dish, or small bowl. Place a layer of blueberries on top of oatmeal. Add dollop of yogurt on top. 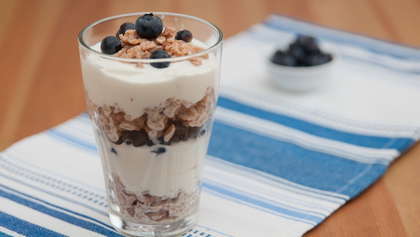 Sprinkle with granola and top with a fresh blueberry.